After the usual intro of The Daring Young Man On the Flying Trapeze, the first surprise is immediately sprung. Memories of the legendary Bottom Line gigs of 1975 are evoked with an affectionate performance of The Crystals’ Then (S)he Kissed Me. The lively and melodic Radio Nowhere follows, occupying what has become its customary second place in the set and the momentum is maintained with Out In The Street, with the audience singing along from the beginning and greeting both Clarence Clemons’ sax solo and his brief vocal contribution to the extended coda with ecstatic cheers. The song ends with a loud and dissonant climax which leads straight into a superlative version of Adam Raised A Cain. Searingly emotive in its recognition that the animosity between father and son lies not in their ostensible differences, but their underlying similarities (a theme also explored in Independence Day), this rendition features stunning guitar work, stated by the Point Blank website to be “the greatest guitar solos ever in this song.” This is, quite simply, the best performance of the song that I have heard. The audience sings along enthusiastically during a boisterous performance of Spirit In The Night and then Max Weinberg plays a lengthy drum solo as Springsteen, as has become customary, collects the audience requests. First up is a bubbly Rendezvous, followed by a full-band For You, which is played very fast. I have stated previously that the slower, solo piano version of this song more effectively complements the subject matter of the song, but somehow here it is precisely the dichotomy between the sombre theme of suicide and the exaggerated jauntiness of the music which makes the performance so poignant. We are then transported back again to 1975, as Harold Dorman’s Mountain Of Love evokes memories of the classic Main Point concert of February of that year. As Springsteen points out, the audience was getting “very sassy” by challenging the band to play songs from 25 or 30 years before, but they rise to the challenge after a “quick rehearsal” and a delighted audience claps along throughout. Springsteen returns to safer territory with a superb rendition of Backstreets and then the guitar of Steve Van Zandt contributes to a fine performance of Gypsy Biker. Nils Lofgren then gets his chance to shine on Because The Night, a perennial Magic Tour highlight. Springsteen reminds us of past glories by prefacing She’s The One with a few lines of Not Fade Away though, curiously, none of the music (the band continues to play She’s The One). The first disc ends with the overtly political Livin’ In The Future, the spoken introduction to which clearly provokes disaffection among some sections of the audience. Disc two begins, to quote both the Backstreets website and Godfather’s sleeve notes, with a “muscular” version of Cover Me, a welcome rarity on this tour. “We can make the music,” Springsteen then informs the audience, “but we need you to make the noise” and they duly oblige throughout the “house party” that is Mary’s Place. 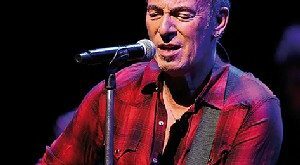 Brucebase contends that this, and many other performances since 2002 ,contain an excerpt from Major Lance’s The Monkey Time, though this seems to consist of little, if anything, more than a shared use of the lyric “are you ready?” Then comes a real surprise in the shape of Drive All Night, another audience request. 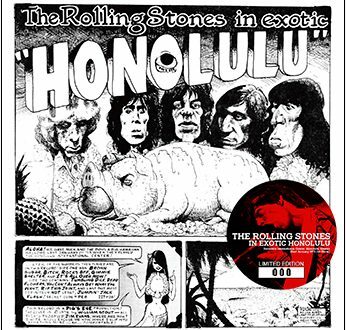 Slow, soulful and with beautifully understated playing from the band, the song is another highlight of the show and a line from it gives this release its title. There follows the usual trilogy of The Rising, Last To Die and Long Walk Home, the latter two complementing each other particularly well, before the main part of the show reaches a euphoric conclusion, as usual, with a tremendous performance of Badlands, longer than usual and notable for two false endings and a great deal of vocal participation from the audience. After an appeal for the St. Louis Area Food Bank comes the usual start to the encore in the shape of the delightful Girls In Their Summer Clothes. This is followed by Springsteen’s magnum opus, Jungleland. It survives some off-key violin from Soozie Tyrell at the opening to develop into a tremendous performance, the high points of which are an atmospheric sax solo from Clemons and some beautiful piano from Roy Bittan. Ebullient performances of the Devil With The Blue Dress Medley, Born To Run and Dancing In The Dark ensue and then Weinberg’s drumming and Tyrell’s violin lead us into the customary showstopper, American Land. Tonight, however, it doesn’t stop there. First we are treated to a rendition of the archetypal Springsteen number, Thunder Road, dedicated here to Olympian hero Michael Phelps. This is followed by “delerious, triumphant” performances of Little Queenie (appropriate in Chuck Berry’s home town) and Twist And Shout, which take the show to three and a quarter hours. The bonus tracks kick off with three songs from the final magic Tour show in Kansas City. Springsteen is not exaggerating when he informs the audience that the band are “going to start with something obscure” because what follows is the very first live performance of Ricky Wants a Man Of Her Own. Originally recorded during sessions for The River at the Power Station in July 1979 (not 1977 as stated in the notes for Tracks) , this version of the song features a deliberately cheesy organ sound, as does the next number, Cynthia, which leads Springsteen to comment in between that “we’re gonna do back-to-back Farfisa songs tonight!” The latter song was originally recorded at the Hit Factory in April 1983 during sessions for Born In The USA (and also appeared on Tracks). The third extract from this show is a taut solo acoustic Devils & Dust. The next number, I’m Goin’ Down, was a surprise choice to open the encore at the Foxboro show. 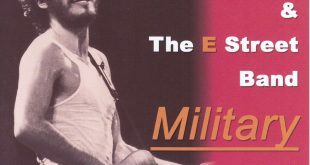 “We have here,” said Springsteen (though his words are not on the CD), “the rarely played and even more rarely requested…” before showing the sign and launching into an energetic performance. Part Man, Part Monkey, heard here in a rendition from Hershey, PA, was originally recorded in 1987 during the Tunnel Of Love sessions, though the version which appeared as the b-side of Better Days and later on Tracks was recorded in 1990 during sessions for Human Touch. The song references the notorious “Monkey Trial” of 1925, where John Scopes was found guilty of teaching evolution in a Tennessee school in contravention of The Butler Act. 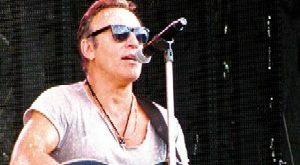 At the Hershey show the song, making its tour premiere as a request, led Springsteen to comment on the so-called “Scopes 2 Trial” in Dover, PA, where eleven parents successfully challenged the local school board’s decision to teach “intelligent design,” claiming that, as a form of creationism, it challenged the First Amendment. After sending the song out to “the Dover parents…and good science education,” Springsteen and the band play a slower version of the song with a distinct reggae feel. “Let’s see if the band can get it,” Springsteen says at the beginning, and he feels the need to shout “bridge!” at the appropriate moment to keep the band together, but it is a highly effective performance. The audience-recorded sound of the St Louis concert is extremely good, albeit not outstanding. It has more clarity and immediacy than the Milan and Paris releases recently reviewed and makes for enjoyable listening, especially at high volume. Aside from I’m Goin’ Down and Crush On You, which are rather muddy and indistinct, the bonus tracks come with sound that is very good to excellent. In particular, the spare acoustic sound of Devils & Dust is caught superbly. 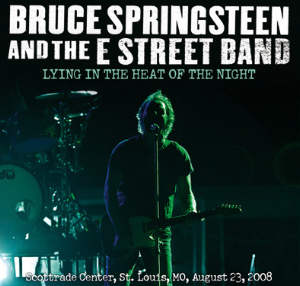 This release comes in Godfather’s usual trifold packaging, with a striking shadowy photograph of Springsteen on the front cover and other photos from the concert. There are sleeve notes but no booklet. 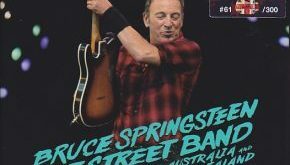 With what is probably the best performance from a great tour, together with an extensive and thoughtfully chosen selection of bonus tracks, this set constitutes an essential purchase for all Springsteen collectors.